We all know that the webOS and the TouchPad are the kings of multitasking when it comes to tablets, but you can now take that one step even further by purchasing Glimpse by Inglorious Apps. Although it's a hefty $5 price tag as compared to most other apps that are typically less than half that price, Glimpse is very much worth it. Just like webOS itself, Glimpse takes multitasking to the next level, but you really have to use it to appreciate the kind of power that it brings along. So what exactly is Glimpse? At the most basic level, it's an app that splits the screen in up to three sections that allows you to essentially run different mini-apps within each frame. The mini-apps are referred to as widgets, but don't get this confused with the types of widgets that you may see on other mobile operating systems. 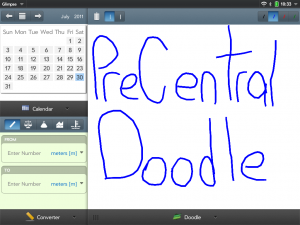 These are interactive and customizable mini-apps that can be as fully-featured as a web browser or twitter client, or as simple as a post-it note or drawing app to doodle on. 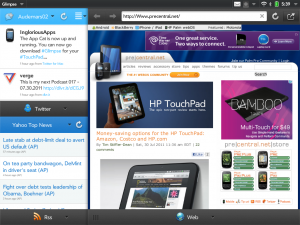 And to be clear, third-party apps or even webOS stock apps do not run within Glimpse, as it only supports the widgets that are packaged along with it. When you first load up Glimpse, you will see 3 frames. There are two smaller frames on the top- and bottom-left, and a much larger frame on the right side that takes up about two-thirds of the screen. In the Application Dropdown menu on the top-left of the screen, you can customize your "views" by de-selecting any or all of the frames and the screen will adjust accordingly. For example, if you deselect "Bottom Left" then the "Top Left" will expand to fill up the entire left-side of the screen. You can also take advantage of the sliding panes functionality of webOS 3.0 to turn the "Right" pane into a full-screen view at any time on the fly. Finally, at the bottom of each pane, you will see the name of the currently active widget along with a dropdown arrow. 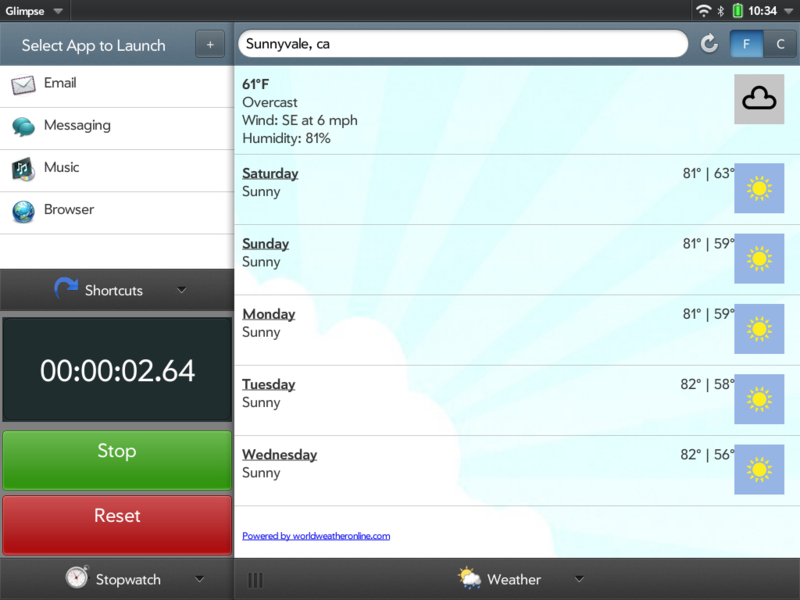 Tap on the name or arrow to bring up a list of widgets that you can select. As of right now, there are 13* widgets available, including Calculator, Calendar, Converter, Doodle (drawing) pad, Notepad, RSS, Short Cuts (mini app-launcher), Stop Watch, Tasks, Twitter, Weather, Web, and YouTube. There are so many use cases for how to use Glimpse that there will be no way that we can cover all of them in the review, but you can easily find yourself spending an hour on your TouchPad and never needing to leave Glimpse. While the web browser may not have all the bells and whistles of the stock browser, it comes close, as it has the functionality to share pages, view your browsing history and save bookmarks. But remember that since the web widget within Glimpse is its own stand-alone "app", your history and bookmarks are not integrated with those from the stock browser although you can "Open in Browser" any page you are viewing to launch the page in its own web browser card. 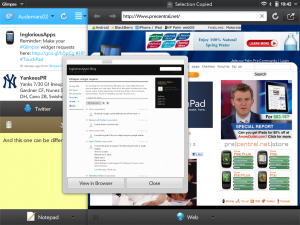 While browsing the web, you can also have a Twitter widget running to keep up with your tweets while the RSS widget keeps you informed of the news. Unfortunately, the RSS feed does not integrate with your Google Reader feeds (at least not yet), but it does come with a some predefined feeds, including Podcast feeds so you can listen to the PreCentral Palmcast right from within Glimpse! Then, let's say you get a phone call and you need to jot down a quick note. You change your RSS widget to the Notepad that essentially gives you a post-it to write down some quick text (which you can then delete, tweet or email as needed). You realize that you then need to add that to your calendar so you copy the text on the notepad and change the twitter widget to the Calendar. As a reminder, the calendar is not the same as opening the calendar app on your TouchPad. This will just show you a generic monthly calendar view without any of your calendar entries shown (that's still a webOS system/security limitation), but tapping on a given day within the calendar will give you the option to create a new calendar entry (in a new card) for that day. Once done, you go back to Glimpse, change the Calendar and Notepad widgets back to Twitter and RSS and you continue right where you left off. 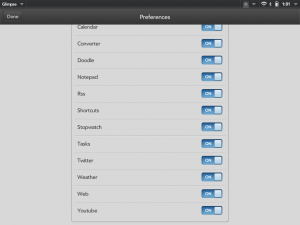 Even though we may refer to some of these widgets as "mini-apps", some like Twitter, Tasks or Converter can hold their own as compared to some full apps in the catalog. For example, the Twitter widget provides you with multiple views for your time, @ mentions, sent and received DMs, search, your profile and favorites, and even supports multiple accounts. That means that you can have 3 different twitter widgets running for three different accounts, all at the same time within the single Glimpse app. Within twitter, tapping a tweet gives you a slew of typical twitter options, while tapping a link will give you a pop-up to view that link in the app, in the browser, or just copy the URL, and tapping a username will give you a pop-up with their profile and some action buttons. To touch on some of other widgets, you have a calculator, stopwatch and weather widget for when you may need quick access for those types of apps, a doodle pad to draw a quick picture, and a YouTube widget that will allow you to search and play videos right in the frame of the app. Lastly, you have a shortcuts widget that will allow you to create a mini app launcher for any app you have on your TouchPad. It comes with four shortcuts preinstalled for Email, Messaging, Music and Browser, but you can add or remove any others. 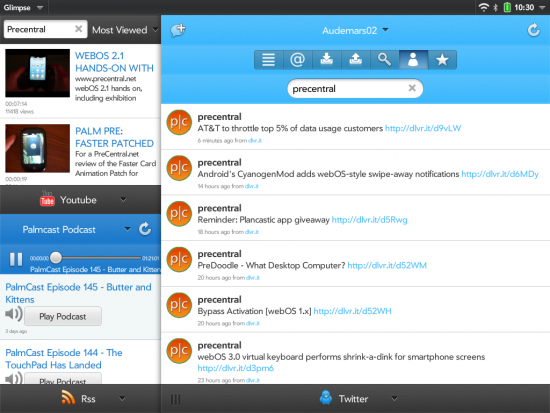 Glimpse also takes advantage of webOS notifications for your Twitter accounts and allows you to set the refresh frequency for the RSS, Weather and Twitter widgets. 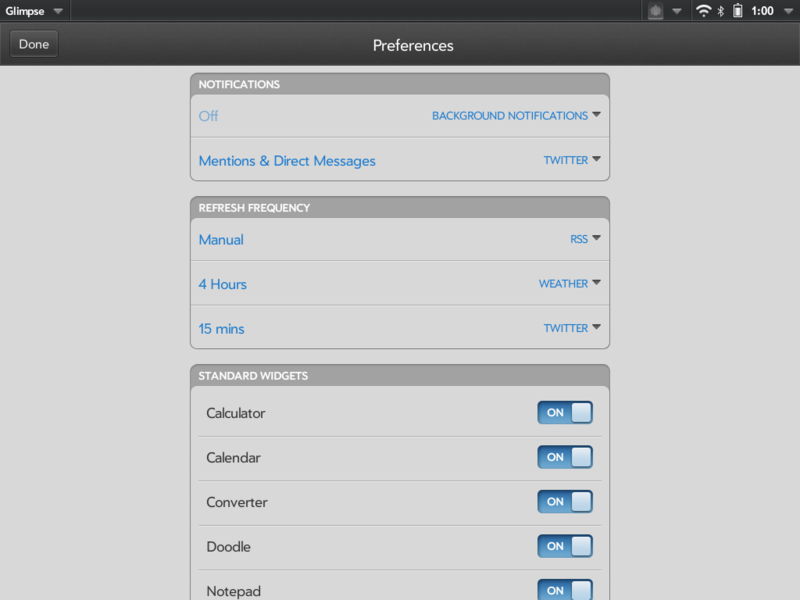 To modify these settings, access the Application Dropdown menu from the top-left of the screen and select Preferences. 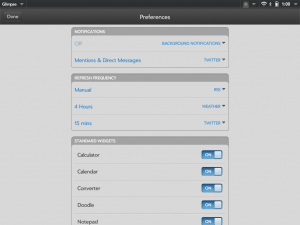 From the Preferences screen, you also have the ability to hide any of the widgets from showing within the app. So if you have no plans to ever use Tasks you can just toggle that to Off and you will never see it again. Glimpse even has Just Type integration, too. If you activate Glimpse as a Just Type search option, you can start a Just Type action with a "tweet/", "youtube/", or "web/" prefix to load up Glimpse directly to that action. 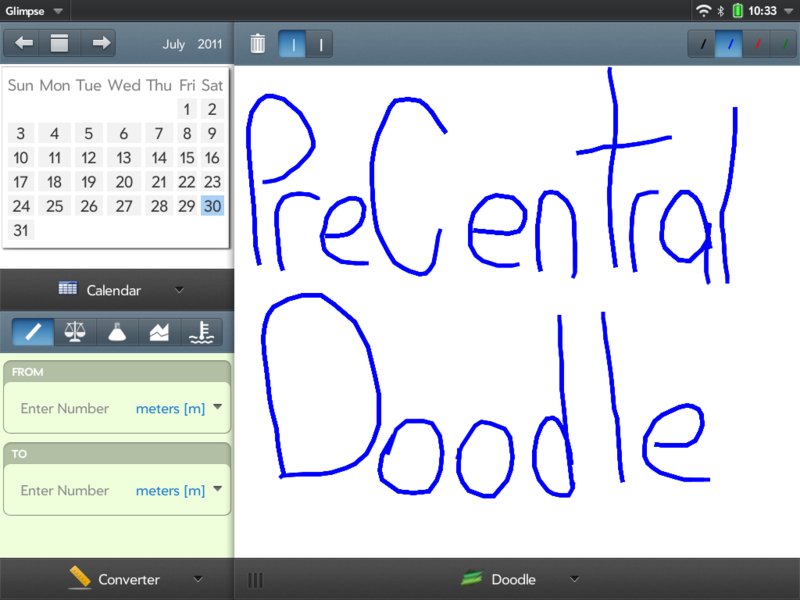 For example, to load up precentral.net within the web widget of Glimpse, just type "web/precentral.net" and tap the Glimpse option. The more you play with Glimpse, the more little features and you will find. 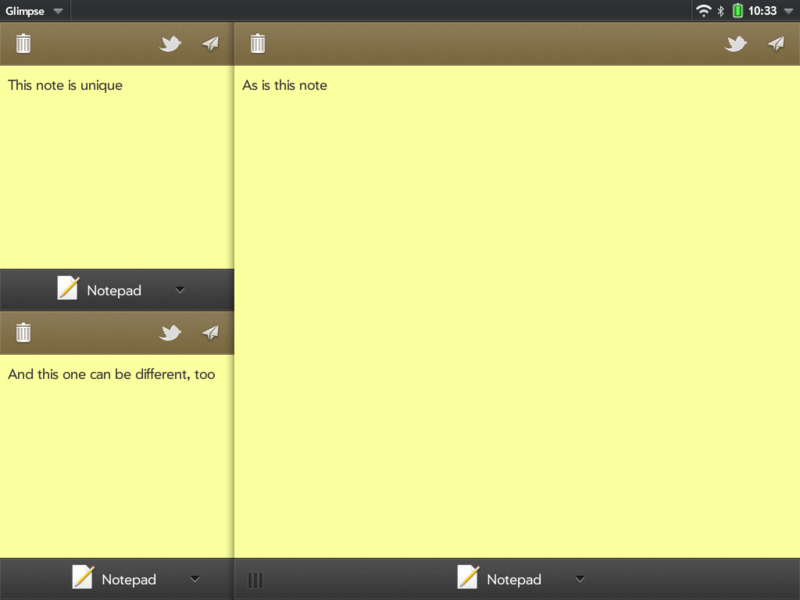 For example, each Notepad widget acts independently, so you can keep up to 3 different notes active at once. 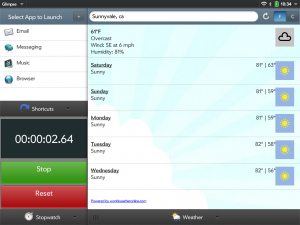 You will find that the features of some widgets may be different depending on what frame it's loaded in. 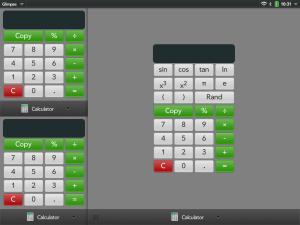 The Calculator widget, for example, has just your most basic features while in the top- or bottom-left frames, but adds additional advanced functions in the larger right frame. As you can imagine, your specific usage of Glimpse could differ from day-to-day or even minute-to-minute. The 13 widgets Glimpse already has is worth the $5 price tag, but Inglorious Apps is hard at work adding more plus as adding additional functionality to the existing widgets. He is taking requests if you have any, and I would personally love to see a neato! widget added. But in the meantime, I was able to actually bookmark my neato! 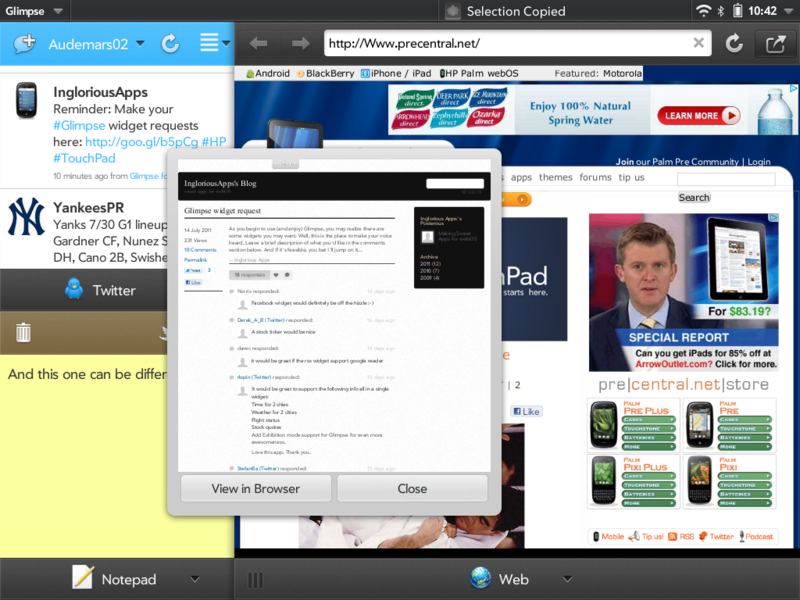 homepage in Glimpse's web widget and turned "receiving" on to create a pseudo-neato! widget. Just use your phone's "send to computer" functionality to send it directly to the touchpad! I can't wait to see what else Inglorious Apps adds to Glimpse, but will definitely be able to keep myself occupied just trying to figure out everything it can already do. * Technically, there are actually 14 widgets availale. 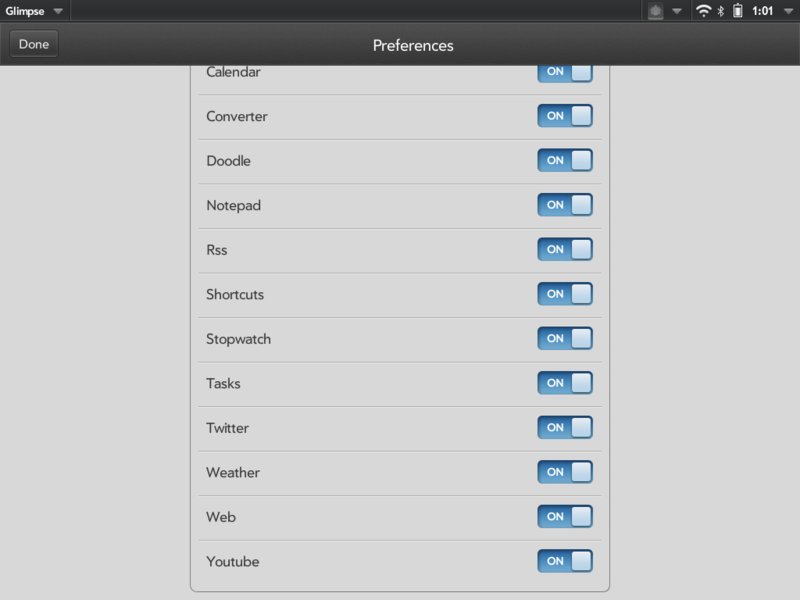 If you have Pix, also by Inglorious Apps, installed on your TouchPad, there is a Pix widget that you also have access to.